10 grams contains approximately 420 beads. The size 8s measure about 3mm and the hole size is approximately 1.5mm. 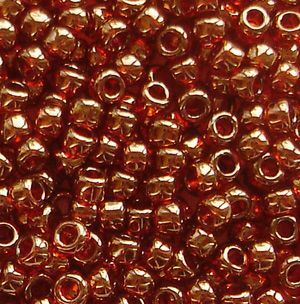 Toho seed beads are high quality, and are very consistent in size and shape. They are ideal for beadweaving, loomwork and bead embroidery. They have a larger hole than most other manufacturers, which allows more thread passes through each bead. Made in Japan, Toho means Eastern Treasure.